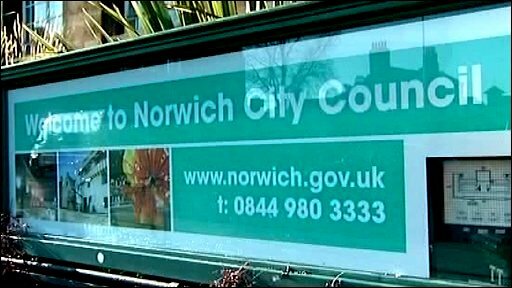 It will cost £300,000 to put right zero-rated Norwich City Council's troubled housing department, it is claimed. The independent Audit Commission has given Norwich City Council's housing department a zero-star rating. The Commission said parts of the housing service in Norwich were "poor" and had "uncertain prospects". The report follows the sacking of a senior housing officer after she and other staff moved into a sheltered bungalow complex meant for the elderly. The City Council said it had a housing improvement plan in place to tackle the Audit Commission's recommendations. Mark Elsworth, Audit Commission senior manager, said: "Norwich City Council has not developed its housing provision in a way that ensures all its tenants receive a good service. "However, it responded positively to our inspection and is starting to put improvement plans in place." The independent report found that residents were not sufficiently involved in the housing service, including measures to test their levels of satisfaction with the service. We have established a stronger working relationship with our tenants such that they can already see improvements. The city council said it was putting in place a new management team and spending £300,000 on improvements to the service. Its former head of housing was sacked following a disciplinary hearing. The officer had moved into a sheltered housing complex called Greyhound Opening after the elderly residents there had been moved out ahead of its demolition. The Audit Commission said positive points could be found in the speed of Norwich City Council's housing service response to reports of anti-social behaviour and the conditions of estates which were generally attractive, clean and tidy. Councillor Brenda Arthur, executive member for housing and adult services said: "We are determined to improve our housing service. "We have established a stronger working relationship with our tenants such that they can already see improvements. "We have officers who are committed to implementing the changes which need to be made."